directly below the main link for Microdermabrasion"
away, with our unique techniques & technology offerings"
"treatment options and settings" available. state-of-the-art, current & advanced equipment technology. pieces, along with our unique techniques & years of experience. "No Airborne Crystals in the Air you Breathe"
with the "Stringent" special design "Medical Grade"
Order Sealed Individual Sterile, Non-Reusable "Exclusive"
Safe, Effective and Beneficial Skincare Treatment. Diamond Tip Microdermabrasion™ applied "Simultaneously"
more aggressive treatment, while still being non-irritating. 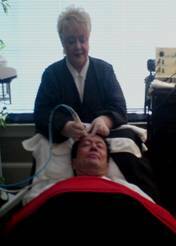 Treatments both our Crystal and Diamond Tip"
glowing, smooth skin, and no down time from work. eye area, neck, arms and the top-of-the- hands. used for this very specific eye area treatment only. settings per each client's specific requirements. not offer basic or one-size-fits-all skincare treatments. "Diamond Tip" Microdermabrasion™ Skincare Treatment. a perfect combination for those needing extra exfoliation. greater exfoliation & further promoting collagen stimulation. for Exfoliating Men's courser texture facial area's. for your "specific" skin type and achieve maximum results. invigorated with a smooth & healthy natural looking glow. we offer ~ However, still wish to improve the look and feel of their skin. for informational purposes only, and should not be relied upon as medical advice. The information on this site is not intended to diagnose, prevent, treat or cure any disease. Pearl District, Salem, Eugene, Corvallis ~ just to name a few... and the Metro Area in Oregon. Skincare Products for both Skincare Treatments & for your Home-Use Regimen.